Pom Pom is surrounded by a fringing coral reef with minimal lagoon development. As well as a sloping reef on Pom Pom, we also have deep, vertical walls starting at 27-30 metres depth, located on the Northern Tip, Eastern Plateau, and Lobster Wall dive sites. Depending on the tide, the current at these locations can be strong, offering excellent drift dives with many sea fans and pelagic fish. Although much of the island has been extensively bombed we do still have patches of natural reef. As well as walls and a sloping reef we have a small wreck, jetties and many artificial reef structures around Pom Pom, which make for great diving as many different fish and invertebrates gather around these sites. The water varies from 25 to 29 degrees C, with generally good visibility, averaging on around 20 meters. The marine biodiversity of Pom Pom Island is rich with many rare and uncommon species, of course we have all the beautiful fish you would expect from tropical diving, such as Butterflyfish, Angelfish, Parrotfish, Sweetlips and much more. Pom Pom is a paradise for anyone wanting to spot tiny weird and wonderful macro creatures. With an amazing array of Nudibranchs, Crabs and Shrimp there's always something to spot, even in the rubble. We are fortunate enough to have a large population of Green and Hawksbill turtles, making sightings on dives almost a guarantee. We also see Coral Catsharks, Eagle Rays, Barracuda and Bumphead Parrot fish on a regular basis... so if you're looking for bigger sea creatures we have some of them too! The most exciting thing about Pom Pom Island is that it's a recovering reef, so we are constantly being surprised by the changes happening around us when we dive. You never know what you might be lucky enough to see. Our house reef is directly out the front of our camp, which makes for very easy shore diving, with almost no surface swimming necessary. The drop off starts at 4-5 meters at most of the dive sites around the island, which is perfect for new divers and makes for fantastic snorkelling too. Most of the work is carried out on the house reef so we generally don't have far to go to get to work or monitor our structures. 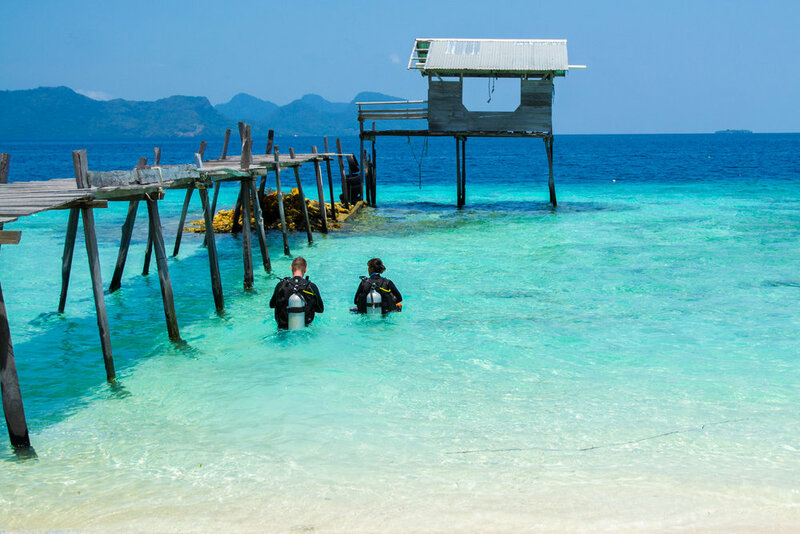 On our 'Sunday Fundays' we often visit neighbouring islands to explore new dive sites. We also visit other islands to collect coral and survey data, so depending on which projects we are working on and permit availability, you may also get the chance to visit some of Pom Pom's surrounding islands. Dive computers are COMPULSORY because of the nature of our dives and the amount of dives we do in a day, we have found the only safe way to organize dive logistics is for everyone to use a dive computer. You can bring your own, or rent one from us for 2 GBP (RM10) per day. If you are staying long term, or doing your DMT with TRACC we can assist you in purchasing your own. Dive booties are essential as at low tide we need to walk over rubble to get to the boats or drop off on the house reef. Open heeled fins are a must because of the necessity for dive booties, you will need fins that accommodate them. Mask: we do have spare masks but for your comfort you will be much happier with your own mask. We all have different shaped faces and therefore need different types of masks. An ill fitting mask can leak, give you headaches and generally ruin your experience. Go to a reputable dive shop and ask for assistance. Snorkel: this is obviously essential for snorkelling, and you are required to have one on any PADI courses you participate in. Wetsuit: some people find 25-29 degrees to be a comfortable enough temperature to dive without a wetsuit, others however get quite cold, a 3mm full length or shorty wetsuit is sufficient for most people. Dive torch: if you want to do a night dive either for fun, or as part of your Advanced Open Water Course you will need to bring your own torch. Gloves: at TRACC we wear gloves on all work dives. We do have gloves here for that purpose but it's nicer having your own diving gloves, so you might like to consider buying a pair.